Income inequality has grown over the last 30 years or more driven by three dynamics: rising inequality of labor income (wages and compensation), rising inequality of capital income, and an increasing share of income going to capital income rather than labor income. As a consequence, examining market-based incomes one finds that “the top 1 percent of households have secured a very large share of all of the gains in income—59.9 percent of the gains from 1979–2007, while the top 0.1 percent seized an even more disproportionate share: 36 percent. In comparison, only 8.6 percent of income gains have gone to the bottom 90 percent” (Mishel and Bivens 2011). Research covered in this publication will be included in the 12th edition of EPI’s The State of Working America, which will be released on Tuesday, September 11. Click here to read more previews from the forthcoming book. A key to understanding this growth of income inequality—and the disappointing increases in workers’ wages and compensation and middle-class incomes—is understanding the divergence of pay and productivity. 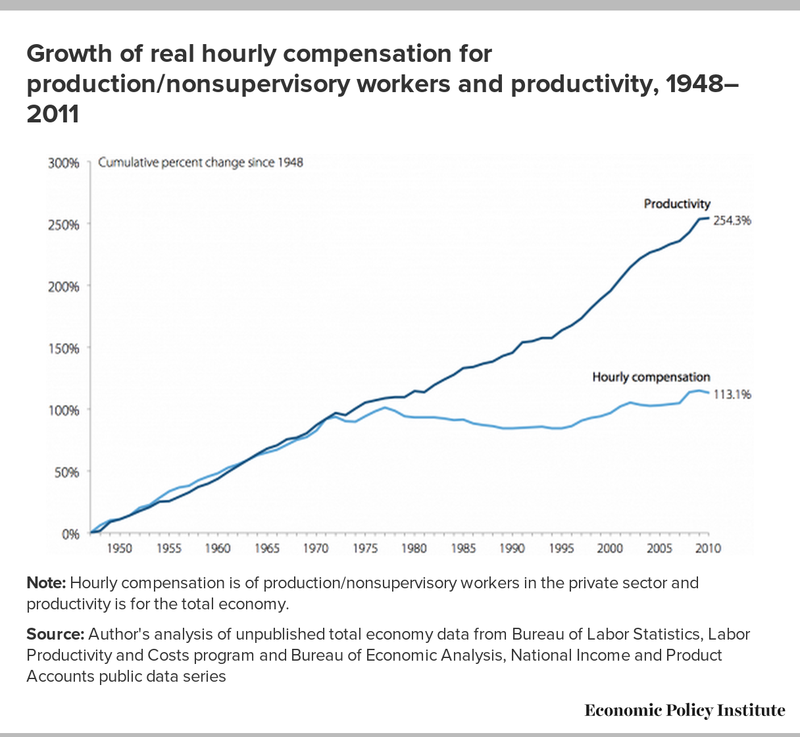 Productivity growth has risen substantially over the last few decades but the hourly compensation of the typical worker has seen much more modest growth, especially in the last 10 years or so. The gap between productivity and the compensation growth for the typical worker has been larger in the “lost decade” since the early 2000s than at any point in the post-World War II period. In contrast, productivity and the compensation of the typical worker grew in tandem over the early postwar period until the 1970s. Productivity growth, which is the growth of the output of goods and services per hour worked, provides the basis for the growth of living standards. However, the experience of the vast majority of workers in recent decades has been that productivity growth actually provides only the potential for rising living standards: Recent history, especially since 2000, has shown that wages and compensation for the typical worker and income growth for the typical family have lagged tremendously behind the nation’s fast productivity growth. This paper uses data from EPI’s upcoming The State of Working America, 12th Edition (Mishel, Bivens, Gould, and Shierholz 2012) to document and explain these trends, particularly those of recent years. The hourly compensation of a typical worker grew in tandem with productivity from 1948–1973. 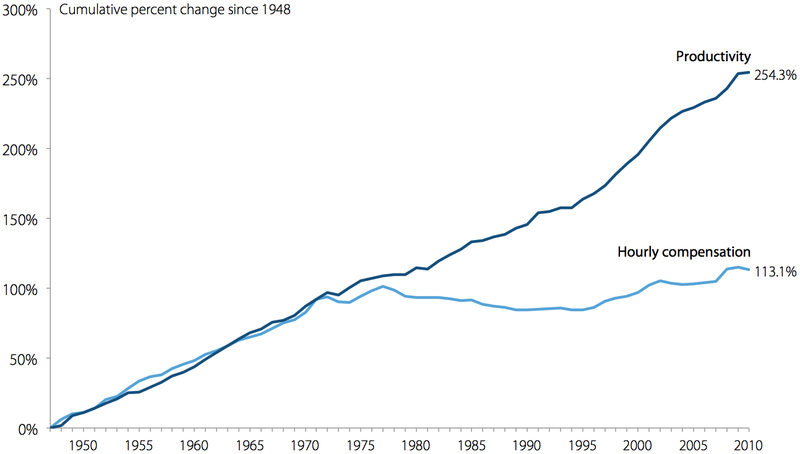 That can be seen in Figure A, which presents both the cumulative growth in productivity per hour worked of the total economy (inclusive of the private sector, government, and nonprofit sector) since 1948 and the cumulative growth in inflation-adjusted hourly compensation for private-sector production/nonsupervisory workers (a group comprising over 80 percent of payroll employment). After 1973, productivity grew strongly, especially after 1995, while the typical worker’s compensation was relatively stagnant. This divergence of pay and productivity has meant that many workers were not benefitting from productivity growth—the economy could afford higher pay but it was not providing it. 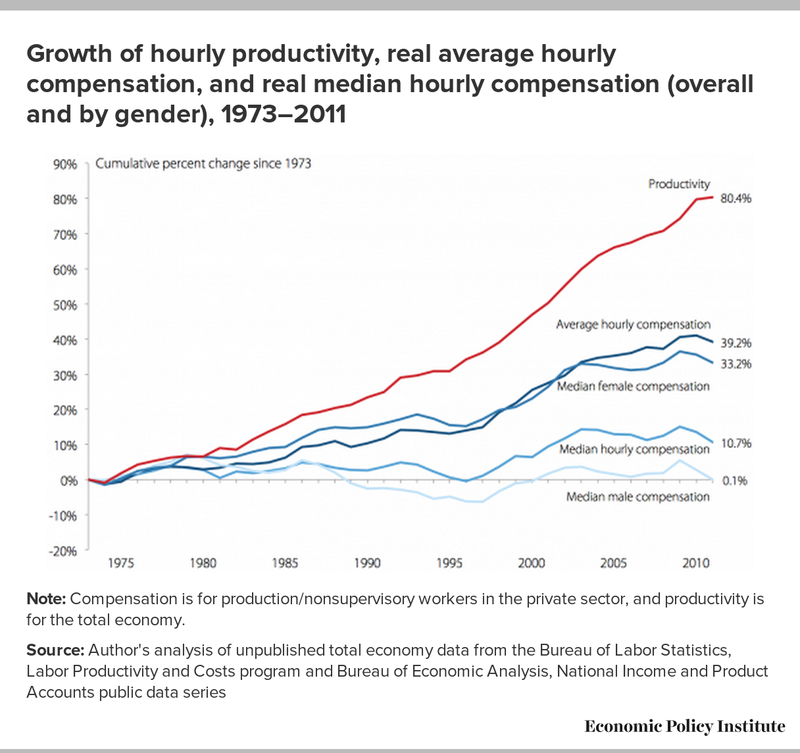 Figure B provides more detail on the productivity-pay disparity from 1973 to 2011 by charting the accumulated growth since 1973 in productivity; real average hourly compensation; and real median hourly compensation of all workers, and of men and of women. As Figure B illustrates, productivity grew 80.4 percent from 1973 to 2011, enough to generate large advances in living standards and wages if productivity gains were broadly shared. But there were three important “wedges” between that growth and the experience of American workers. First, as shown in Figure B, average hourly compensation—which includes the pay of CEOs and day laborers alike—grew just 39.2 percent from 1973 to 2011, far lagging productivity growth. In short, workers, on average, have not seen their pay keep up with productivity. This partly reflects the first wedge: an overall shift in how much of the income in the economy is received in wages by workers and how much is received by owners of capital. The share going to workers decreased. Note: Compensation is for production/nonsupervisory workers in the private sector, and productivity is for the total economy. Second, as also shown in Figure B, the hourly compensation of the median worker grew just 10.7 percent. Most of the growth in median hourly compensation occurred in the period of strong recovery in the mid- to late 1990s: Excluding 1995–2000, median hourly compensation grew just 4.9 percent between 1973 and 2011. There was a particularly large divergence between productivity and median hourly compensation growth from 2000 to 2011. In sum, the median worker (whether male or female) has not enjoyed growth in compensation as fast as that of higher-wage workers, especially the very highest paid. This reflects the wedge of growing wage and compensation inequality. A third “wedge” important to examine but not visible in Figure B is the “terms of trade” wedge, which concerns the faster price growth of things workers buy relative to what they produce. This wedge is due to the fact that the output measure used to compute productivity is converted to real, or constant (inflation-adjusted), dollars, based on the components of national output (GDP). On the other hand, average hourly compensation and the measures of median hourly compensation are converted to real, or constant, dollars based on measures of price change in what consumers purchase. Prices for national output have grown more slowly than prices for consumer purchases. Therefore, the same growth in nominal, or current dollar, wages and output yields faster growth in real (inflation-adjusted) output (which is adjusted for changes in the prices of investment goods, exports, and consumer purchases) than in real wages (which is adjusted for changes in consumer purchases only). That is, workers have suffered worsening terms of trade, in which the prices of things they buy (i.e., consumer goods and services) have risen faster than the items they produce (consumer goods but also capital goods). Thus, if workers consumed microprocessors and machine tools as well as groceries, their real wage growth would have been better and more in line with productivity growth. 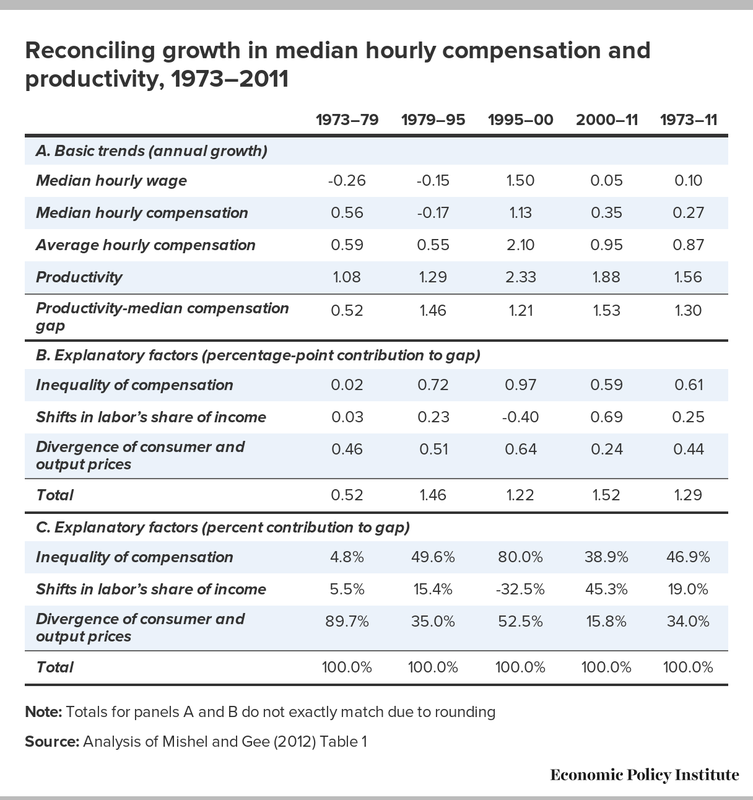 Table 1 depicts the basic trends and identifies the contribution of each factor in driving the productivity-median compensation gap in particular sub-periods and overall from 1973 to 2011. The particular sub-periods chosen are business cycle peaks—years of low unemployment— with some exceptions. The two business cycles, 1979–89 and 1989–2000, are divided into the periods 1979–95 and 1995–2000 to separate the period of low productivity growth from the period starting in 1995 when productivity growth accelerated (and unemployment fell to low levels). The last period, 2000–11, extends from the end of the 1990s recovery to the most recent year of data. Panel A shows the annual growth rates of median hourly wages and compensation, average hourly compensation, and hourly productivity. All measures are for the total economy. The annual growth of the productivity-median compensation gap is also presented for each period. That gap grew 1.3 percent a year from 1973 to 2011 and grew most quickly in the recent 2000–11 period and in the earlier 1979–95 period. Table 1 also shows that productivity accelerated in the mid- to late 1990s, growing 2.33 percent each year, far above the productivity growth of the 1973–1979 and 1979–1995 periods. Productivity growth since 2000 has remained much higher than during the “stagnation” of 1973 to 1995 but less than the productivity growth of the late 1990s. Table 1 breaks down the growth of three factors which can explain the divergence between productivity and median hourly compensation. The first is growing inequality of compensation, which is proxied in this analysis by the changing ratio of average hourly to median hourly compensation. The second is the shift in labor’s share of income, which is captured by changes in the nominal share of compensation in national output (GDP). The third factor is the divergence of consumer and output prices, the terms of trade wedge based on the change in consumer prices (with health benefits deflated by a medical index, and the remaining portions of compensation deflated by consumer prices) relative to prices of national output. The large productivity-median compensation gap in the 2000–11 period was driven primarily by growing compensation inequality and the decline in labor’s share of income, accounting respectively for 38.9 percent and 45.3 percent of the total gap. The impact of terms of trade, or price divergences, was smaller in this period than in any other and accounted for only 15.8 percent of the growing gap between productivity and median compensation. 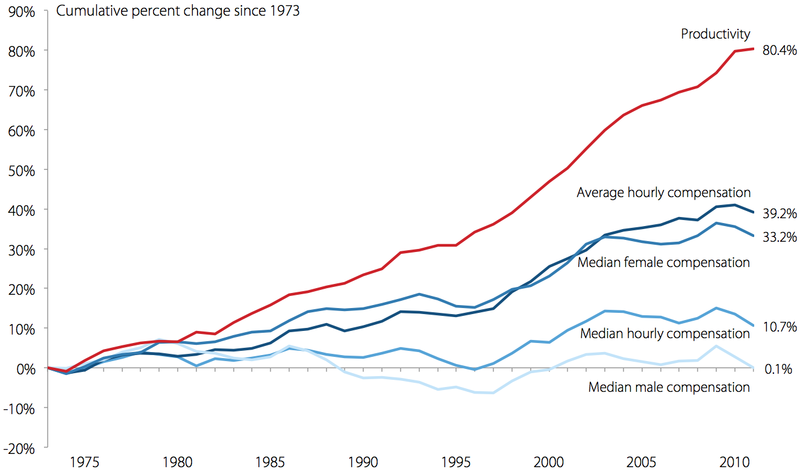 Median hourly compensation accelerated in the mid- to late 1990s but not as much as productivity did, generating a 1.21 percent gap each year from 1995–2000. This gap occurred despite labor’s share of income increasing (therefore reducing the gap) and largely because of diverging prices and a large increase in compensation inequality. In contrast, the earliest period, 1973–79, saw no appreciable growth in compensation inequality or change in labor’s share of income: the productivity-median compensation divergence primarily reflected price differences. Over the entire 1973 to 2011 period, roughly half (46.9 percent) of the growth of the productivity-median compensation gap was due to increased compensation inequality and about a fifth (19 percent) due to a loss in labor’s income share. About a third of the gap has been driven by price differences. The analysis above has shown that from 1973 to 2011, the largest factor driving the gap between productivity and median compensation has been the growing inequality of wages and compensation, followed by the divergence of consumer and output prices and the shift of income from labor to capital. From 2000 to 2011, when the productivity-median compensation gap grew the fastest, the divergence of prices had only a modest impact, whereas the shift from labor to capital income was the single largest factor, accounting for roughly 45 percent of the gap. The forthcoming The State of Working America (Mishel, Bivens, Gould, and Shierholz 2012) will provide a detailed account and explanation of these factors, which are considered briefly here. The inequality of wages and compensation factor has three different dimensions. The first is the substantial gap between the growing earnings of the top 1 percent of earners and other high earners within the upper 10 percent: Between 1979 and 2007 the annual earnings of the top 1 percent grew 156 percent, while the remainder of the top 10 percent had earnings grow by 45 percent. A second dimension has been the continuing gap between the growth of wages at the top (such as at the 90th and 95th percentiles) and the middle (e.g., the median wage) over the entire 1979–2011 period. The third dimension—the gap between the middle and the bottom (measured as the gap between the median wage and the 10th percentile wage)—has emerged in some sub-periods but not in others. The gap grew strongly in the 1980s but remained flat in the 1990s and the 2000s, except for a re-emerging gap among men in the last few years. Any explanations of wage inequality have to account for this pattern of wage growth. Wage inequality at the bottom—called the “50/10 wage gap” because it reflects wage differences between the median and bottom 10 percent—has primarily been driven by periods of high unemployment and the erosion of the minimum wage. The continuing growth of the wage gap between high and middle earners is the result of various laissez-faire policies (acts of omission as well as commission) including globalization, deregulation, privatization, eroded unionization, and weakened labor standards. The gap between the very highest earners—the top 1 percent—and all other earners, including other high earners, reflects the escalation of CEO and other managers’ compensation and the growth of compensation in the financial sector. The divergence in prices of consumption spending and other parts of GDP (business investment, government investment, exports and imports) can be viewed in two different ways. One way is to dismiss the divergence as a technical difference and to treat the associated productivity-pay gap as unimportant and uninteresting. The second view is to note that the widely held and articulated assumption that gains in labor productivity translate into improvements in living standards implies that these two price series—consumption and output— must converge in the long run. Given that this convergence has not occurred for several decades, the second view suggests that productivity is not translating fully into improved living standards, and the divergence between consumption prices and output prices represents another mechanism by which workers are not benefitting from economic growth. Rather than dismiss or set aside this terms-of-trade factor that accounts for about a third of the growth of the productivity-median compensation gap, it deserves serious inquiry and a full explanation. Unfortunately, little research has been done in this area. Saying that changing terms of trade drives the productivity-pay gap is really more of a description than an explanation. Regardless of the cause, the implication is that the “typical” worker is not benefiting fully from productivity growth. The last factor to consider briefly here is compensation’s declining share of overall income and the corresponding rise in the share of income that is capital income (interest, dividends, profit, rent, and so on). Mishel and Bivens (2011) showed that the share of capital income in the corporate sector in the 2000s, especially in the recessionary years after 2007, has been the highest in nearly 70 years. The only time that capital income had a larger share was in the wartime 1940s when policy consciously suppressed wage growth. The share going to compensation was correspondingly at a low point. The rise in the share of capital income in the corporate sector has been driven by a comparably large increase in “profitability,” or the return to capital per dollar of plant and equipment. The shift of income from labor to capital was most evident in the period of rising inequality of wages from 1979 to 1995 and again from 2000 to 2011, a period characterized by rising wage inequality and excessive unemployment. Therefore, the improved profitability and shift of income to capital has occurred alongside the general weakening of workers’ bargaining position in the labor market and can be seen to have occurred for the same reasons, elaborated above. The one period when income shifted toward labor was in the mid- to late 1990s, when persistent low unemployment helped fuel broad-based real wage improvements (though wage inequality at the top still continued its growth). Productivity growth has frequently been labeled the source of our ability to raise living standards. This is sometimes what is meant by the call to improve our “competitiveness.” In fact, higher productivity is an important goal, but it only establishes the potential for higher living standards, as the experience of the last 30 or more years has shown. Productivity in the economy grew by 80.4 percent between 1973 and 2011 but the growth of real hourly compensation of the median worker grew by far less, just 10.7 percent, and nearly all of that growth occurred in a short window in the late 1990s. The pattern was very different from 1948 to 1973, when the hourly compensation of a typical worker grew in tandem with productivity. Reestablishing the link between productivity and pay of the typical worker is an essential component of any effort to provide shared prosperity and, in fact, may be necessary for obtaining robust growth without relying on asset bubbles and increased household debt. It is hard to see how reestablishing a link between productivity and pay can occur without restoring decent and improved labor standards, restoring the minimum wage to a level corresponding to half the average wage (as it was in the late 1960s), and making real the ability of workers to obtain and practice collective bargaining. Bureau of Labor Statistics. Labor Productivity and Costs program. Various years. [http://www.bls.gov/lpc/]. Unpublished data provided by program staff at EPI’s request. Mishel, Lawrence and Josh Bivens. 2011. Occupy Wall Streeters are Right About Skewed Economic Rewards in the United States. Economic Policy Institute Briefing Paper No.331. Mishel, Lawrence, Josh Bivens, Elise Gould, and Heidi Shierholz. 2012 (forthcoming). The State of Working America, 12th Edition. An Economic Policy Institute book. Ithaca, N.Y.: Cornell University Press. The State of Working America is EPI’s authoritative and ongoing analysis of the economic conditions of America’s workers. Visit StateofWorkingAmerica.org for up-to-date numbers on the economy, updated when new data are released.